REVOLUTION D.F. 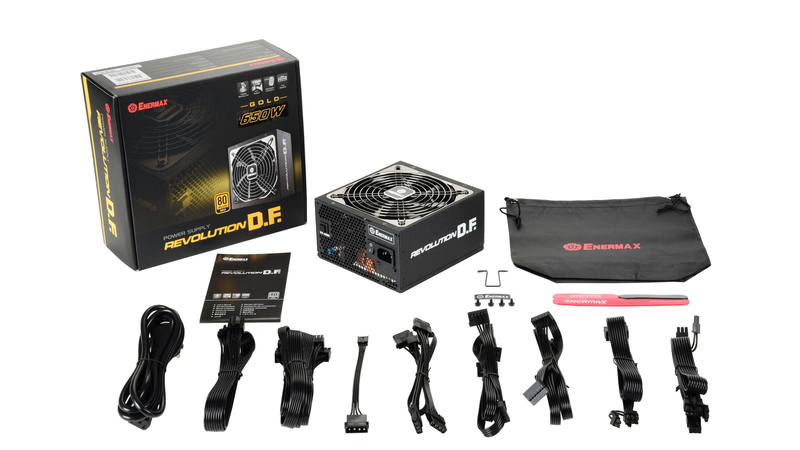 is a full modular 80 PLUS® Gold certified PSU series with the patented DFR™ (Dust Free Rotation) technology, preventing dust accumulation and granting a cleaner and long lasting PSU. The D.F. Switch design offers an on button activation of the DFR™ mode at any time. The choice to use only 100% Japanese 105°C electrolytic capacitors ensures the high build quality and a longlasting product. Based on an advanced DC-to-DC circuit the power supply is capable of delivering a perfect voltage regulation and very stable power output. The built-in SAC (Smart Airflow Control) design keeps the PSU fan spinning at 400 RPM upto 70% load for a almost inaudible operation. REVOLUTION D.F. 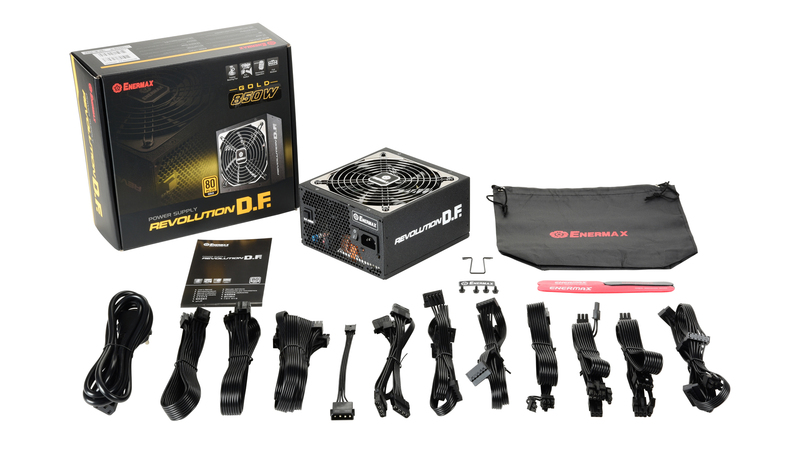 is designed for high-performance gaming systems requiring high standards in quality and performance. Up to 94% efficiency at 230VAC between 20 and 100% load. The PLATIMAX D.F. 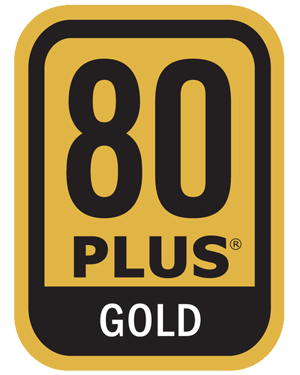 series is 80PLUS® Platinum certified. PLATIMAX D.F. helps systems to meet the EU eco-design directive 2013 ErP Lot 6 and 2014 ErP Lot 3 (< 0.5W in standby mode*) due to a high-efficient 5V standby (+5Vsb) circuitry. Moreover it supports the EU regulation no. 617/2013 demanding amongst others 85% efficiency at 50% load and 82% at 20% and 100% load. 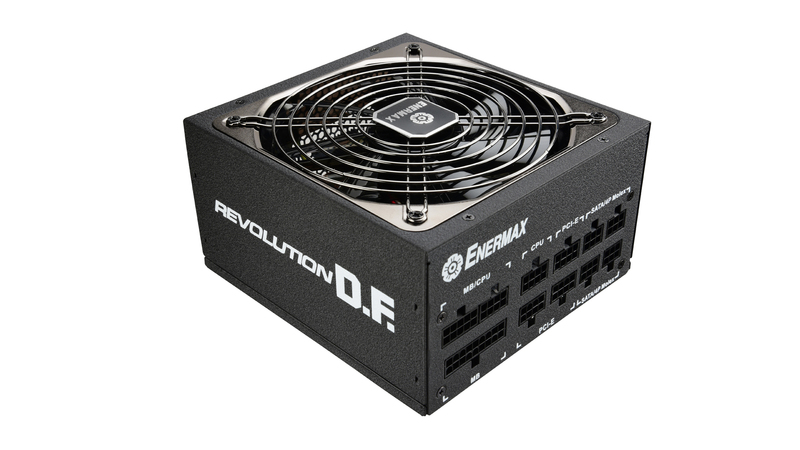 At least four 6+2P (8P) PCI-E connectors ensure power for multi-GPU systems (MGPU & SLI™) and overclocked processors. A multi-rail design with four 12V rails distributes the power with maximum stability and safety. SLEEMAX™ cables are individually sleeved, which gives them a high-end look. In addition, they are flatter and more flexible than conventionally sleeved cables and can therefore be laid better behind the cladding. The fully modular cable management allows an easy system installation and cable routing and improves the air circulation inside the case. Extended 70cm CPU connector cable for installation in large cases. Thanks to the smart semi-fanless control Platimax D.F. series operates completely silent up to a system load of 40% for the 750/850W and 30% for the 1050/1200W models. 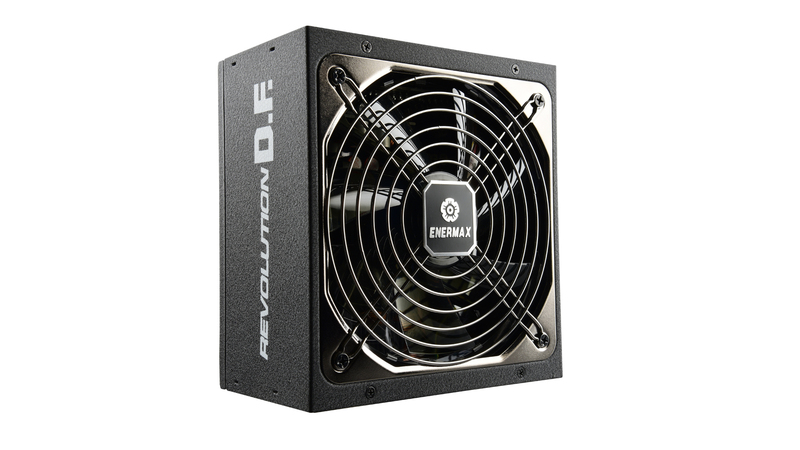 The integrated 13.9cm Enermax fan with patented Twister Bearing™ technology ensures an efficient and continuously silent cooling and long lifetime with up to 160,000 hours MTBF. The patented technology DFR™ (Dust Free Rotation) technology prevents dust from accumulating on the fan blades. 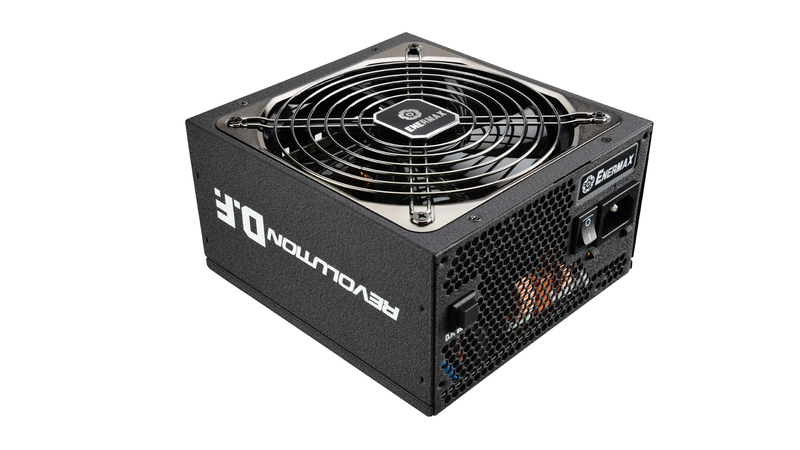 After starting the PSU, the fan spins in reverse at full speed for a few seconds removing dust. Afterwards it returns to normal operation. 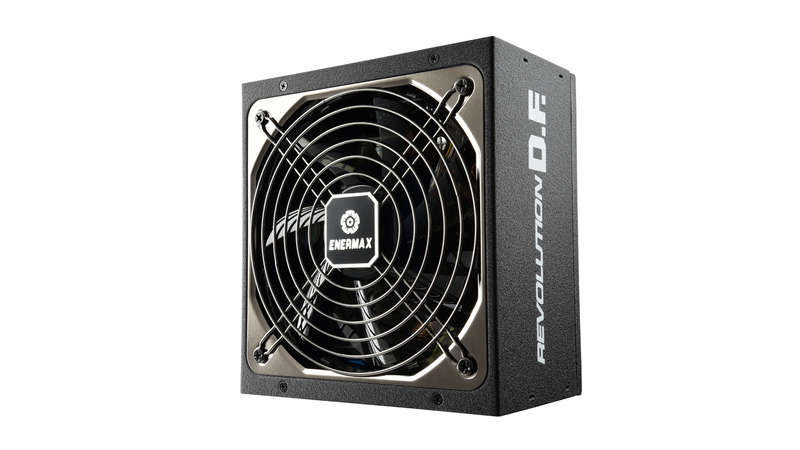 The SAC (Smart Airflow Control) design keeps the PSU fan spinning at almost inaudible 400 RPM upto 70% load to provide the optimal silent experience. 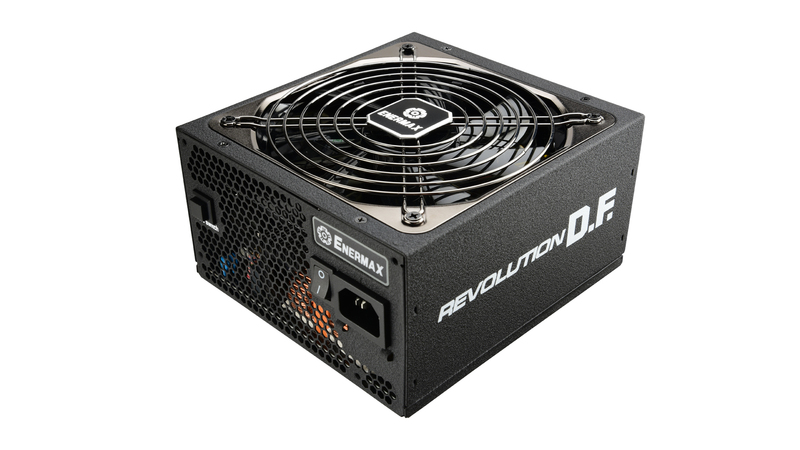 The D.F Switch is placed at the back of the PSU and allows manual activativation of the DFR™ funktion. The D.F. Switch turns the fan immediately into backspin, removing accumulated dust. Regular use of the DFR™ funktion can help to reduce dust accumulation and prolong the lifespan of the product. 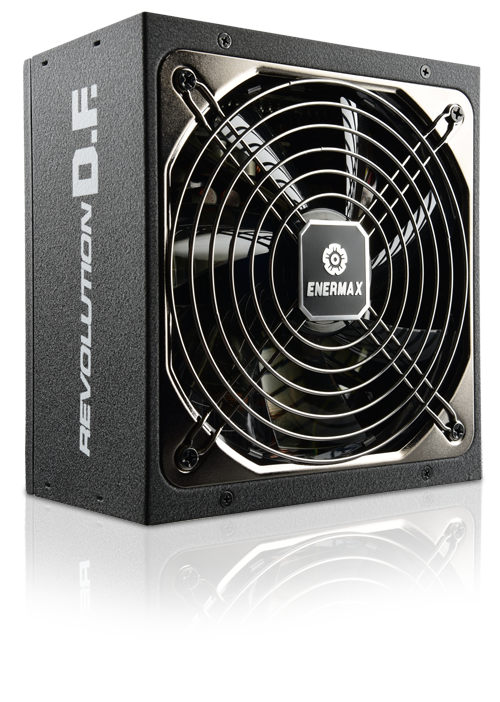 Enermax only uses high-quality components including first-class Japanese 105°C electrolytic capacitors for maximum stability and durability. Enermax SafeGuard, multiple protection circuit that keeps the power supply and the system save from damage by short circuit (SCP), over voltage (OVP), under voltage (UVP), over current (OCP), over temperature (OTP), over power (OPP) as well as surges and inrush current (SIP). Non-Stop 24/7 industrial class performance. 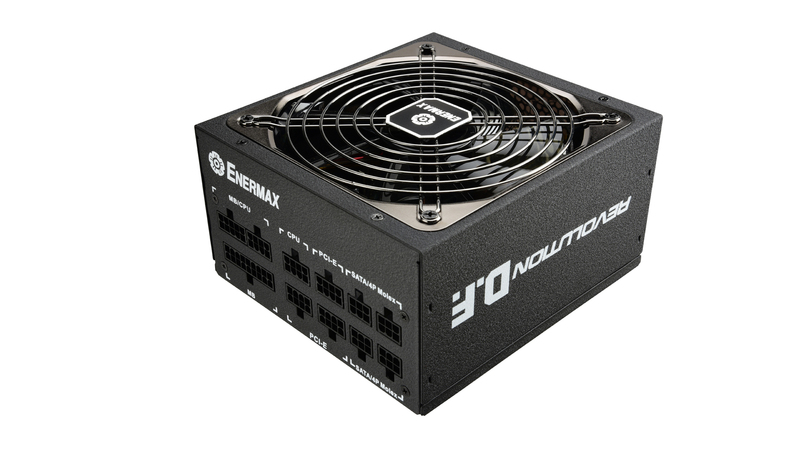 Full rated power output at 50°C ambient temperature. Revolution D.F. 650|750|850W provides multiple 12V rails with individual over current protection. Please divide the load of multiple graphic cards between the 12V rails to prevent triggering the over current protection. Graphic cards with high power consumption have multiple PCI-E connectors and can be splitted between 12V3 and 12V4 sockets. 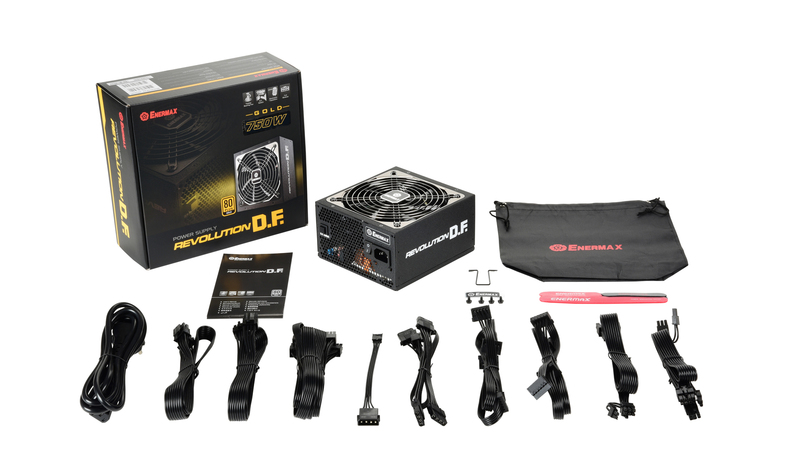 Product Pictures – Revolution D.F.